Well, when I finally found the time between the feedings and the burpings and the changings and the sleepings to turn on my sewing machine, I didn’t use it to make something fun and exciting and new for me or even something cute for the little one. Instead, I used it to make a pillow. For someone else, no less. I think it’s a pretty awesome pillow though. 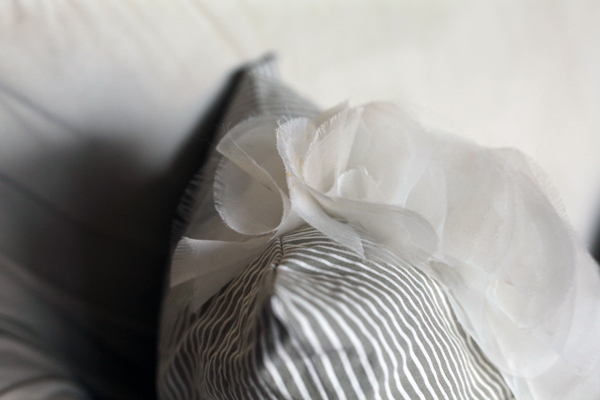 The petals that run down the length of the pillow, simple circles cut out of silk organza, were the motivation behind the project. They once belonged on the skirt of a beautiful wedding dress of a close friend from college. During said friend’s wedding reception reverie, I noticed a petal here and a petal there on the floor. I guess all the dancing was too much for some of them! Thankfully, there were so many on the skirt that it would have taken weeks of dancing before their disappearance would have been noticeable. It occurred to me that something could be made from the fallen petals, a little wedding keepsake if you will, so I started collecting them. I tried to be subtle about picking them up, but others noticed nonetheless. I expected them to give me crazy looks, but instead they joined in. It became a game of sorts – who could get to the dropped petal first, who could find the most. The thing is, at the time I had no idea what I was going to do with them. Should I add them to a garment, something reminiscent of the wedding dress? Should I add them to a bag, something she could carry and use? Or, should I add them to something for the house, something she would see on a daily basis? When I came across this pin, I knew my search for what to do with these petals was over. 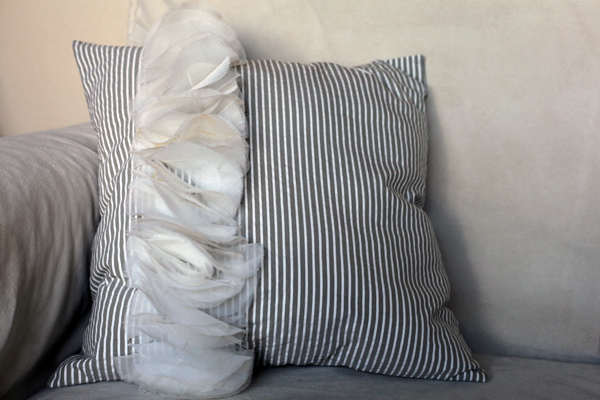 I knew the petals would eventually become a ruffle border on a pillow. Only now I had to find the perfect fabric for the pillow itself. 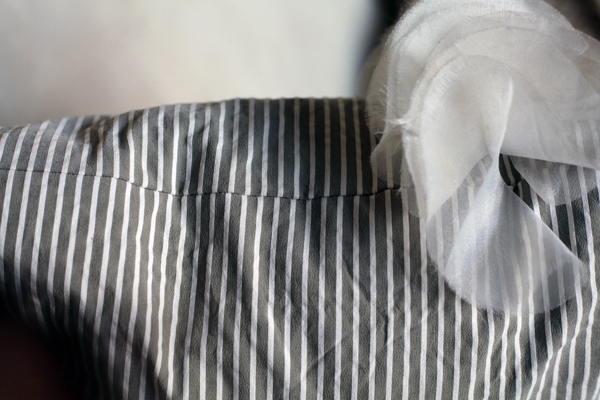 When I made my husband’s recent ivory button-up shirt, I had way more of the striped accent fabric than I needed for the shirt. Mood‘s minimal order is a half a yard, and after the shirt was complete, it felt like I still had a whole half a yard left! Not enough for a garment of its own, but plenty for a pillow! I got to thinking that the neutral gray-and-ivory stripes might look pretty good with the petals. 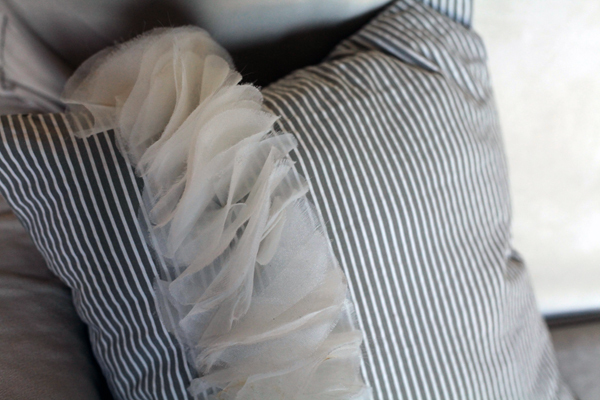 And, the stripes would help me make sure my ruffle border was perfectly straight. To begin, I cut out two 18″ by 18″ squares of fabric from the striped fabric. Next, I identified an ivory stripe about a third of the way across one of the squares and marked it with a pin. I then hand sewed 40 or so of the petals down that entire ivory stripe, spacing them approximately a half an inch apart. I also hand sewed 40 or so additional petals to the right and left of the first row in order to give the ruffle border the same random, petals-everywhere feeling that the dress had. After the petals were all sewn in place, I machine sewed the two squares of fabric together, being careful not to catch any of the petals while doing so. I also tried to match the stripes along the seams. As you can see above, I did okay, particularly when I was further away from the petals. I left a small hole on one side so I could turn the pillow right sides out and stuff it full of polyfill. A final bit of hand sewing closed it up and finished it off. Now I just have to find the time to make the trip to the post office. I hope she likes it! Before I disappear again into the land of new-mom, I figured I’d share another photo of my baby girl. I know I’m biased, but I think she’s pretty cute. Your baby girl is beautiful! Congrats! Pillow is cute too! That is the most thoughtful gift – what a good friend! 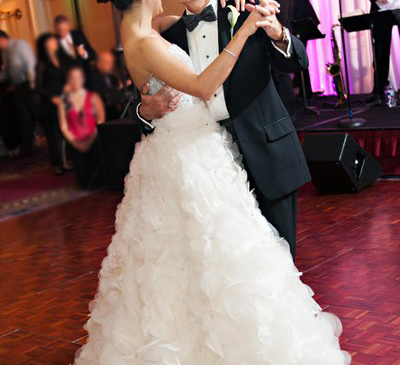 The bride gown was gorgeous!!! The pillow is very nice and a special gift. What a thoughtful gift to make. And a cute and happy baby. I am in awe that you were able to make such a thoughtful and perfect gift when you have so much new in your life right now!! Your little girl is oh, so so cute. What a thoughtful gift for your friend, she will adore it. Your little girl is precious. Look at that full head of hair! Oh my! She is a cutie! Your baby girl is, indeed, gorgeous. I’m in awe that you managed to sew something at this busy time – and it’s a lovely, lovely gift. what a thoughtful gift! and baby is completely swoon-worthy, so cute! Very cool pillow and very cool baby! Very sweet idea for a gift..and even sweeter baby girl. Enjoy. What an amazing gift! I bet your friend will love it! Your sweet girl is getting so big! She’s adorable! Oh my goodness, she is too adorable! =) And the pillow is such a great idea for a gift. She is adorable! Enjoy her!!! Your baby is beautiful! I love your Blog and am thankful that you take the time to share your projects. That is a lovely gift and such a selfless act. Amy – I think you really should keep her. 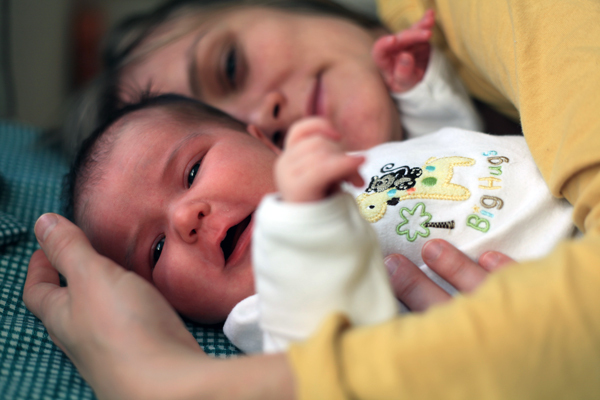 She IS pretty cute, and I hope you are getting lots of snuggly, cuddly new-mom time with her. Enjoy!! That will be such a lovely keepsake for your friend. And the baby is pretty cute, too! she is so cute! and I can’t wait to see the baby clothes I know you will make 🙂 happy house hunting. Soo Cute and the pillow is pretty neat too! What a little cupcake. I know you are having fun falling in love! Your baby is so cute! I’m glad you are enjoying a lot of mommy time! AWWWWWWW!!!!!!! So cute! Many congrats, Amy!!!!! And welcome to your wee one.